All tickets are $5.00 each, no refunds. Come join us for a paranormal investigation at the Sweetwater County Library. For more information stop by the library or call 307-875-3615. The Sweetwater County Library has been hosting a Ghost Walk for several years now. What started out as a Young Adult program has grown to include Young Adults and Adults alike. One question we are asked more than we like is “Is the Ghost Walk a Spook Alley?” The answer is no. It seems that because the SWCL Ghost Walk has traditionally been in October some people assume that anything to do with the paranormal is also some type of Spook Alley. This may be the case for some locations but as for the Sweetwater County Library it is not. We pride ourselves on keeping our Ghost Walks a paranormal investigation. If you are attending with a spook alley theme in mind, you will be in for a surprise. During a Ghost Walk you will be guided through the library with a group by either Ellie Davis or myself. The group will stop by several of the so called “hotspots” in the library that have reported paranormal activity. These spots include the Ladies Room, the Gallery, the Multi-purpose Room, Youth Services, Young Adult Section, the Workroom, back hallway, and the Staff Lounge. As you are guided on your tour the guide will tell stories reported in the SWCL Ghost Log by staff and patrons. I have several ghost hunting gadgets that we allow a few chosen tour participants to use. They gadgets are a KII meter, EMF detector, laser grid light, digital thermometer, and digital recorder. Cameras, video recorders and cell phones are used to record evidence as well. Anyone attending may also bring ghost hunting gadgets if they wish. Our one requirement is that if you do catch evidence you share with us to be recorded in the Ghost Log and High Spirits: The Ghost Log Blog. As the tour moves through the library we will stop to do several EVP sessions. An EVP is an electronic voice phenomenon or basically a voice or noise recorded that would not normally be heard at the time. During the history of the Ghost Walks these are some of the best evidence gathered. Recordings have been captured of everything from a little girl telling us her age to a man’s voice saying “Just keep walking”. In the last two years attendees have been lucky enough to catch a few photos of the ghosts that have joined us on our tours. Paula Birell captured the photo of the gentleman with a top hat walking along the back of the book stacks, Kyle and Shalise Lamb caught a photo of a little girl peeking out from behind the new book display. And Hannah Redden caught a ghost with long dark hair at the bottom of the stairs looking down from the upper hallway. We always appreciate those that share with us. A big thank you to all of you that do. When asking questions we use the KII, EMF and digital recorders of various types. From personal experience it was a moment of shock the first time I used my new KII (that my son Wilson bought me for Mother’s Day. Yes this is true.) The first time you see the lights on the KII light as you ask a question, then it stops until another question is asked, will certainly make you think. We have seen total non-believers suddenly ask to use the device to check for tampering. When they realize we do not tramper with the devices or add props or any such things to our Ghost Walks, their whole demeanor changes. Just recently I was asked if we use props or stage the paranormal events in any way. The answer is always no we do not. The SWCL strongly believes in the truth, whatever that is. As we tell anyone that asks “It is what it is.” If you attend a Ghost Walk you are not promised you will see, hear, or feel anything. Rather our hope is that the spirits/ghosts will choose to interact with us on the particular night. We assume they would like to be treated with respect and we try our best to respect them as well. New this year we are providing more Ghost Walks due to popular demand. The first will be May 5th and tickets go on sale April 2nd at the Sweetwater County Library only. We are charging a $5 fee per ticket to help raise money for the SWCLS Foundation. July 28th for a Dinner/Ghost Walk Fund Raiser ($100 per plate) A Very special event for a limited ticket sales of 20. Please come join us for a real paranormal investigation. For more information please stop by the Sweetwater County Library or visit the website or blog. For those of you interested there will be several Ghost Walks during 2012. The first is May 5th. New this year we will be a $5 donation per ticket that will go to the SWCLS Foundation. Tickets will be sold at the Sweetwater County Library only, starting April 2nd for the May 5th event. For more information please contact the Sweetwater County Library or stop by. As I look at the new books listed on the SWCLS Card Catalog, I noticed a new author in our collection. 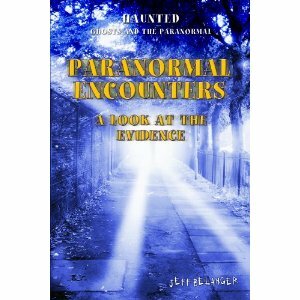 Jeff Belanger has a new title available “Paranormal Encounters: A Look at the Evidence”. Jeff Belanger, author and website host has put together another book on the paranormal. This is one more to add to his growing list of books. History, ghosts, folklore, and magic—the concepts are a part of our collective consciousness, and though no one can explain exactly how it all works, few can match Jeff Belanger’s ability to bring the unexplained out of the fringe and into living rooms and near our office watercoolers. Jeff Belanger leads a very haunted life. He’s been fascinated with the supernatural since age 10, when he investigated his first haunted house during a sleepover. Through the years, Jeff has interviewed hundreds of people about their experiences with the profound. His objective approach to the subject makes the supernatural accessible to a wide audience. He brings personality and humor to this subject, which makes him one of the most sought-after experts in the field. Jeff has been writing for publication since 1992. He’s worked as a magazine editor, journalist, and freelance writer, and has authored numerous books on the paranormal—his books have been published in five different languages. He’s also the founder of Ghostvillage.com—the Web’s largest and most popular supernatural community, according to Google.com and Amazon.com. He lectures around the United States to audiences big and small, and he’s become a recognized media personality, appearing on more than 100 radio and television programs worldwide. The Staff, Ellie, Bianca, Amber, and I began the night by setting up and preparing for the tours. Kenedie Grant and Hannah Redden were our assistants for the night. As usual we did a group circle and a protection prayer for us as well as for the participants. The energy was high and I reported to Ellie and Bianca that my skin felt “charged”. Not sure what that was. K2, EMF detector, digital recorder, digital camcorder, laser grid, infrared Thermometer, flash lights and ghost box. 6:50 pm-The second group game in and we did the introduction and explanation of the tour. We started in the Lady’s Room and moved on to the Gallery then Youth Services. We stopped and did an EVP session. Nothing much was happening up to then. We started working our way along the back of the library and the K2 started to get small “blips” on the lights. This continued as we reached the Young Adults area. We tried the ghost box, but had no luck. Again we stopped and did an EVP session. We did get a few more “blips” on the lights of the K2, but not a lot. We moved on the front of the library. Once we reached the Front Desk we stopped and asked the spirits a few questions and nothing seemed to be happening, so I mentioned that we should move on. Just as I said that the lady that was holding the K2 hollered that it is “really lighting up!” It was. It was lighting all the way to red and it stayed there about a minute. Everyone was very shocked. Most tour participants were new this year and had never seen this before. We started inviting the “spirits” to continue on with us and it lit up to red again. We took this as a sign that they would. We moved on to the back workroom (by my desk) and did an EVP session and we continued to get “blips” on the K2 and EMF. Everyone was really excited by now. I told them the y can feel the energy and that may be why they are coming in stronger. I reminded everyone to keep an open mind and try not to block the energy. It seemed we were getting responses to our questions. We tried the ghost box with no luck again. As we moved on to the back hallway, the K2 and EMF went crazy. We stopped and did an EVP session and again we were getting what seemed to be answers to our questions. The ghost box was not giving us much, maybe a possible word, but that was all. We moved on to the garage where once inside, someone said they saw a possible shadow. The K2 continued to go off and also the EMF. Ghost box only gave us static. This continued, but due to time restraints we had to move on. We then continued up the stairs to the Staff Lounge. Everyone gathered around the table and we started another EVP session and tried the ghost box again. No luck with the ghost box but we did continually get what seemed to be responses to our questions. Mostly our questions where “Is there anyone that would like to talk to us” with answer of “yes” by lighting up the K2. “Can you tell us your name?”. K2 went off, but I did not get anything on the digital recorder. We also asked “are you a little girl?” or “are you male….are you female?” The answers seemed to be yes, and female. Everyone was very excited. As we guide the tours we tell as many of the stories/reports as we have time for. We do this continually as we go. 8:50pm-The fourth group was brought in and there was an immediate energy change. I know I felt it. There was a group of six, three gals & three guys, that came in from Manila, Utah. The gals where really high energy. We did the usual introduction and explanation and began the tour. Right from the start, Shalise Lamb stated that she felt a little girl with her. I told her that we have had reports of a little girl. She kept saying “I know, she is here with me”. Everyone was taking pictures of the Gallery and the front of the library. We stopped and I told the story of the guy that saw the spirit by the windows at the front of the library. The K2 started lighting up and the EMF too. Everyone got very excited. The energy level was huge. As we moved to the Youth Services area again Shalise Lamb stated she felt something with her, a little girl. (Shalise Lamb and Vicky Walters both are very high energy and pixie-like) I feel the little girl was attracted to their energy. We moved on to the back of YS and the K2 and EMF continues to go off. We did an EVP session and tried the ghost box. We did not get anything direct from the ghost box. Several including William April stated that he felt someone there. A lady (David Martin’s mom) started telling a tale that was told by her grandfather who was one of the workers when the old city cemetery was moved. The tale is of a woman that was dug up that was dresses like Calamity Jane, she called her “Two gun Annie”. Her grandfather had stated that when the wooden coffin was brought up it cracked open and she was there. It seemed that her nails were terribly rough and l the workers had a theory that she might have been buried alive and had tried to claw her way out. Very sad! We asked a few questions, “Is there anyone here that would like to talk to us?” K2 lit up and everyone was very excited. We asked if the Calamity Jane dressed lady was here and we only got a small reading. We asked if the little girl was here and the K2 lit up. We moved on down the back of the library stacks. I don’t know if it seemed much darker there just because it was later in the night or because the spirits were following us. That is what I actually felt. I was relaying stories and as we reached the area by the back door and the table there the K2 lit up and Shalise Lamb suddenly got almost nauseated. She visibly started to shake and was acting odd. I thought maybe she was sick and tried to get her to sit down. She said “No, you don’t understand, I feel the little girl”. She did not look well. I thought we might have to have her leave. We started to walk towards the Young Adult area, it was about 5 feet. Shalise suddenly had a very strange look on her face. I asked her “Are you ok?” She said “I am fine, its gone!..Whatever that was is gone. I feel the little girl.” She seemed ok, so we did an EVP session there in YA. We continually got what seemed to be responses to questions. We asked Q-“Are you the little girl?” A-K2 lit up, so yes. Q-“Are you happy we are here?” A- K2 Lit up, so yes. Q-“Are you sad?” nothing happened, so no. Q-“Do you like being here?” A-K2 lit up all the way, so “Yes”. We discussed that fact that all the energy here may keep them happy, and there are always different people around. Maybe the spirits really do like that??? We welcomed the spirits to follow us as we go. We started moving up to the Front Desk. Several people said they felt energy or something. At the Front Desk the EMF began screeching. Several people that hadn’t spoken much started telling the spirits, “It’s ok, we want you to come”. We then moved on to the back workroom. We then go a lot more K2 hits. At first I thought it might be the computers, but it was not. We also checked the typewriter and it was not. If you get close to the lights over my desk the K2 and EMF will go off, but this was a ways away. I told the story of the little girl EVP from last year and I said to the little girl “I am sorry if I made you mad last time”. The K2 lit up. I wish I would have caught an EVP at this point, but I did not. We asked for Michael, K2 and EMF went off. We asked for Gretchen, Annie, and Elizabeth. K2 did not light up. Next we headed down the hallway and used the laser grid. Someone said they saw something, but no one else did. Not sure on that. K2 and EMF continually had hits off and on. We could not find a reason why. We headed into the Outreach Room and then to the garage. We asked again if the ladies were there and we did get some lights on the K2 and EMF. We did the laser grid on the ceiling and a couple people said they saw a few spots block out. We tried the ghost box, and mostly we just got static. We did an EVP session, but we did not get anything. The tour group next headed up the back stairs where I explained about the picture of Elizabeth Moriarty. We continued to the Staff Lounge. Immediately several of us smelled pipe or cigar smoke in the hall. As we entered the Staff Lounge there was a different feeling. William A. stated that he thought someone was standing by the door to the storage closet. I also felt like something was there. We gathered around the table and the EMF really screeched. The K2 went to red. Something was happening. Shalise and Vicky both said they felt the little girl. We took the K2 and ran it around Shalise and it was all around her, we tried around Vicky and it was all around her too. Everyone was very excited. Several people in the group said they felt a bit energy and cold. There is a vent in that room, we checked and they said it was not it. One lady had on capris and said she felt a cold swirl around her legs. Someone stated that the pull rope on the blinds moved, but nothing else there did. We turned the ghost box off because we just got static. We tried to do an EVP session (nothing). The EMF continually screeched the whole time we were in that room. The K2 continually lit up while we were in that room. Everyone was pumped! You could feel that something was really going on. WOW. As we finally started to leave and head down the stairs two of the men said they smelled cigar smoke again, but it seemed to move a bit. As we got down to the Multi-Purpose Room everyone was just pumped. I am sure I am missing some things. This tour was so high energy. Wow. I have no doubt that is what drew the spirits to us. If we would have had half this energy in the other tour I did it would have been great. I do think both my tours had plenty of K2 and EMF hits that are unexplained. People seemed happy overall with the tours and they would love to come back.